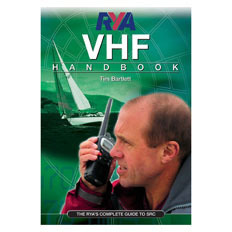 This is a RYA VHF radio course online for anyone who owns a fixed or hand-held marine VHF radio. A marine radio is an important piece of safety equipment to have on board and it is vital to understand the correct operational procedures. Unnecessary radio transmissions could block out a Mayday distress call. The Short-Range Certificate (SRC) is the minimum qualification required by law to operate a VHF radio fitted with Digital Selective Calling (DSC) on any British vessel voluntarily fitted with a radio. All new VHF sets are either fitted, or can be interfaced, with DSC allowing calls to specific vessels. If you hold the ‘old’ VHF licence (pre-1999) you need to upgrade your qualification if you purchase new equipment. This can be done by completing this course and taking your final exam. This Online distance learning course can be undertaken at the candidates own pace in the comfort of their own home. The course is web-based and compatible with PC, Mac, iPads and Android tablets. The cost of the Online course is £59 (including a free copy of the RYA VHF Handbook, shown opposite, worth £14.99*). To purchase a course just click your preferred payment method below. Once successfully completed, the candidate will download a completion certificate. This will then make the candidate eligible to take the SRC assessment. More details can be found within the “VHF (src) FAQs” and “VHF Exam (SRC assessment)” tabs shown below. 3. Operational procedures of the GMDSS and detailed practical operation of GMDSS subsystems and equipment. Do I have to take the SRC assessment at the same training centre that I purchased the online course from? No you don’t. You can purchase an online course from any approved Training centre and take the assessment at any other approved Training centre. If it’s not convenient to go to Sailtrain for my assessment, how can I find a nearer Training centre. When you purchase your VHF online course we will send you a link that will allow you to find your nearest. There are literally hundreds countrywide so it it won’t be a problem finding a suitable centre. Is there an alternative to taking the online course? Yes there is. You can take a 10 hour classroom course followed by the one hour assessment but whether you opt for the Online course or the Classroom course you must still take an assessment at an RYA approved Training centre of which, Sailtrain is one..
Can I just take the assessment without taking the course? No you can’t. You must successfully complete a course before you will be eligible to take the assessment. Is it possible to test the RYA Online VHF Radio course before I decided to purchase the full online course? Will I be able to take the RYA SRC exam with SAILTRAIN after taking the Online RYA VHF Radio course? Yes you will, all you will need is your pre course knowledge certificate and your completed RYA short range application form including photograph. THE RYA will charge you an additional exam/licence issue fee of £60. Is the RYA Changing the way they deliver the RYA VHF Radio course in 2014? Due to European Regulations (Cept) the RYA will be changing the way the course is delivered in 2014. The new method, delivered by SAILTRAIN, is to take the New RYA Online VHF Radio course which you will be able to take on a PC or a MAC. Then bring along your online completion certificate, on the date we agreed at the time of booking, and take the short Practical/Theory exam. Will I get a chance to familiarise myself with the actual Radio Equipment I will be using during my exam? Yes, absolutely. Before the exam starts you will be given the ability to “play” with the radios you are going to use. You will be given sufficient time to become familiar with the menus and functions of the particular radios you will use. Also available will be the Radio manual and a quick start guide. Is there a minimum age for the VHF Radio Course? 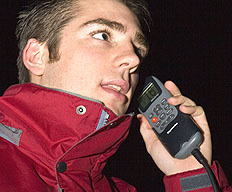 The minimum age for the VHF Radio Course is 16 years old. 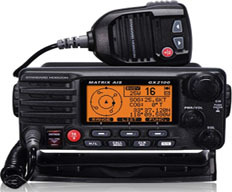 Yes, you can upgrade the restricted Marine VHF radio licence, you can now book the new format SRC examination direct but its unlikely that you wil pass the new examination without taking some refresher training before attending the examination, i.e. : take the online course . Will SAILTRAIN run a exam for a group, i.e. a dive club or sailing club etc? If I pass the course, can I teach my crew on the boat how to use the VHF radio? Yes, when you have passed the vhf radio course you can ask a member of crew to use the radio under your guidance, but it would be a good idea for them to enrol on the course in the future. I have purchased a second-hand radio with DSC. Can I fit it to my boat? Any radio equipment must be Type Approved – beware second-hand equipment or radios bought from online auction sites or jumble-sales. In addition, equipment from the USA is completely different from European radio – it will not work properly, and is illegal for use in Europe. At current prices, it may be more cost-effective to buy new rather than buy second-hand and pay to have it sent back to the manufacturer for resetting. I only have a hand held VHF radio, what type of licence do I need? You will need a ship’s portable licence issued by Ofcom. The hand held vhf radio will be issued with an international callsign, which includes the letter T to denote that it is a transportable and licensed to an individual and not the vessel. But, you still need to have passed the exam to use it. I’m going to use my radio in the European inland water ways. Do I need Automatic Transmitter Identification System ( ATIS) fitting to my radio? I have just purchased an Emergency Position Indicating Radio Beacon (EPIRB ). Who do I register it with in the UK? I am a Sea Kayaker and have been told that as well as a VHF hand held radio and mobile phone I can get a PLB. What type do you suggest? We suggest a small Personal Location Beacon ( PLB), such as a FASTFIND made by McMurdo. It’s totally waterproof and has a GPS 50 channel receiver inside for better location in an emergency situation. Also this small PLB operates on a global 406 MHz system with a 121.5 MHz homing signal. For more information Click here for the Fastfind website. How long does it take for my licence to arrive? Up to 21 Days, but usually this is much sooner – sometimes 7-10 days. There are Fast-Track Options Available, for an additional fee. You will be given an opportunity (minimum 15mins) to familiarise yourself with the sets prior to your exam commencing and your assessor will be on-hand to guide you through its various featurers but will be unable to guide you on any other aspects. However, if you do not pass within these 2 papers, you will need to re-attend on a separate day and an additional charge will apply. You can take your final VHF/SRC exam at any RYA approved training centre regardless of where you purchased your Online course. Should you require a link that will allow you to find your nearest of the 550 or so exam centres, just requested the link in the notes section when you make your online course payment/booking. So that the necessary exam paper work can be passed to the examining centre, where students wish to take an exam at a Training centre other than at Sailtrain, they should provide the details of the examining centre. An email sent to Sailtrain at info@sailtrain.org.uk containing the examining centre name and address is sufficient. 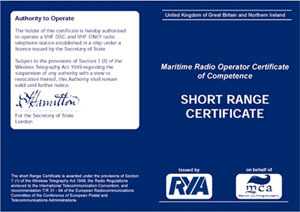 On successful completion of the assessment (practical & written paper) the VHF application form will be sent to the RYA along with your passport photo and certificate fee (Not included in the price of the Online SRC/VHF course is the charge made by the RYA of £60, for the issue of the licence). The RYA certification department will then post your RYA VHF certificate directly to you. The exam costs £25 plus a Licence issueing fee of £60 from the RYA making a total of £85. To Book simply click the add to cart button. *Postage outside of the UK will be charged at cost.